1966 was a good year to be collecting trading cards with a superhero theme. While Topps might get a lot of attention for its handful of Batman sets made that year, another hero has emerged as a collector favorite. 1966 Donruss Green Hornet trading cards remain popular not only for its take on the show, but for offering collectors some of the only Bruce Lee cards. The 1966 Donruss Green Hornet set has 44 cards. Fronts are very simple but equally striking. A full-color photo takes up most of the front. It is surrounded by a thin white border and a Green Hornet logo at the bottom. Card backs offer both a short writeup and a puzzle piece. Five different puzzles can be made with a complete set: two of the Green Hornet, and one each of Kato, Miss. Case and Black Beauty. The fine print on the back also encourages collectors to "Watch THE GREEN HORNET on your local ABC network station." Although The Green Hornet lasted only one season, the show's legacy runs deep. It's credited as helping launch Bruce Lee's career in North America. That gives this set some added attention as the late legend doesn't have many other trading cards. In recent years, Upper Deck created a relic card for a sports set and Breygent had Way of the Dragon poster cards and sketch cards in its 2007 Vintage Movie Posters release. 1966 Donruss Green Hornet cards shouldn't be confused with 1966 Topps Green Hornet Stickers. This is a completely separate release. The cards and stickers also look very distinct. The cards offer a more photographic look at the show while the stickers have lots of design elements. Originally costing five cents, 1966 Donruss Green Hornet packs have five cards and a stick of gum. Boxes have 24 packs. 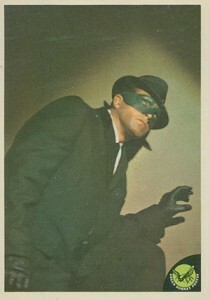 1 The fantastic crime fighter, The Green Hornet. Played by Van Williams. 2 Mike Axford, the crime reporter for the Daily Sentinel, does not know of his employer's double life. 3 Miss. Case is Britt Reid's secretary at the Daily Sentinel and is one of the three people aware of the identity of the Green Hornet. 4 Kato has proved again the power of kung0fu by subduing four vicious criminals. 5 The Green Hornet says to himself, "We must recover the diamonds before the criminals do." 6 The Green Hornet and Kato arriving out of the night surprise the jewel thieves as they are dividing up the loot. 7 Quickly the Green Hornet and Kato disarm the two notorious jewel thieves. 8 The third jewel thief darting out of the room is apprehended by the Green Hornet who renders him helpless. 9 "All right fellows, the party's over," says the Green Hornet arriving out of the stillness of the night. 10 Pointing his pistol at Miss. Case, the criminal tells her, "Call the Green Hornet and get him over here." 11 The Black Beauty entering the hideout is fired upon by the retreating criminals. 12 The Black Beauty has two of the criminals pinned to the wall as the Green Hornet starts after the other criminal. 13 "There he goes!" screams Kato as the Green Hornet leaps over the hood of the Black Beauty in pursuit. 14 "I see him, Kato. We'll soon show him the sting of the Green Hornet." 15 The criminals' leader attacks Kato with a knife and Kato, seizing him by the arm, throws him to the ground. 16 The leader again rises only to be rendered helpless by another of Kato's gung-fu moves. 17 As the Green Hornet closes in, the criminal knows his end has come. 18 "I've got you. Stand up and fight like a man!" yells the Green Hornet. 19 With a left to the face, the Green Hornet has again shown his powerful sting. 20 "Well, thanks to you, Miss. Case, and Kato, we've put away three more criminals." 21 "I saw them running into the house," says Kato as he hurriedly stops the Black Beauty. 22 Quickly leaving the Black Beauty, the Green Hornet and Kato streak towards the criminal's home. 23 The Green Hornet says to Kato, "Go around back while I guard the front." 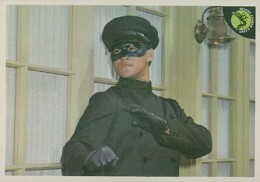 24 The Green Hornet, always ready for action, covers Kato's entrance into the criminal's home. 25 Kato quietly inches his way towards the open door. 26 Watch it, Kato, I hear someone coming!" 27 Kato, springing into action, disables the attacking criminal with one blow. 28 The Green Hornet quickly tackles the second criminal in a short but deadly battle. 29 The criminals, knowing the game is over, start coming out as Kato and the Green Hornet stand ready. 30 "Let's go, Kato! I don't think we'll have any more interference." 31 The Green Hornet checks the bookshelves looking for the hidden compartment. 32 "Watch it, Kato!" the Green Hornet screams as Kato bolts upright to his defensive position. 33 Kato quickly unleashes a flurry of deadly and decisive blows at the criminal. 34 The final gung-fu move lifts the criminal from the floor and the battle is over. 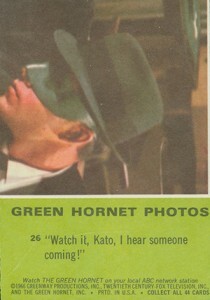 35 Kato turning, quickly realizes the Green Hornet is trapped and rushes to his aid. 36 As the Green Hornet rescues Miss. Case, the Green Hornet yells, "Four more of the criminals are getting away!" 37 Kato quickly crosses the street and captures one of the criminals as he is about to steal the police squad car. 38 Another criminal appears from the bushes but he too is quickly subdued by Kato. 39 "Get the police over here," yells Kato as two more of the criminals are pinned against the squad car. 40 Seeing the stolen car driving away, Kato unleashes his deadly dart. 41 The dart punctures the tire of the criminal's car making his get away impossible. 42 "Let's go, Kato! Our work here is finished." 43 As quickly as it entered, the Black Beauty fades from sight. 44 The people can sleep well tonight. Kato stands ready to help. I have a full set of 66 Green Hornet. Never had them graded but I guess they are all in the range of about a 7. They also have the stickers intact. Would you be or do you know anyone that would be interested in the set? I really need the money so have to sell them can you help me?